CAMPAIGN SIMULATION: Just have a look on how you can design your own campaign. Beginning with the Industrial Revolution era, a workshop may be a room or building which provides both the area and tools (or machinery) that may be required for the manufacture or repair of manufactured goods. Workshops were the only places of production until the advent of industrialisation and the development of larger factories. A machine is a tool that consists of one or more parts, and uses energy to achieve a particular goal. Machines are usually powered by mechanical, chemical, thermal, or electrical means, and are frequently motorized. Historically, a powered tool also required moving parts to classify as a machine; however, the advent of electronics technology has led to the development of powered tools without moving parts that are considered machines. The word machine derives from the Latin word machina, which in turn derives from the Greek (Doric μαχανά makhana, Ionic μηχανή mekhane “contrivance, machine, engine”, a derivation from μῆχος mekhos “means, expedient, remedy”. 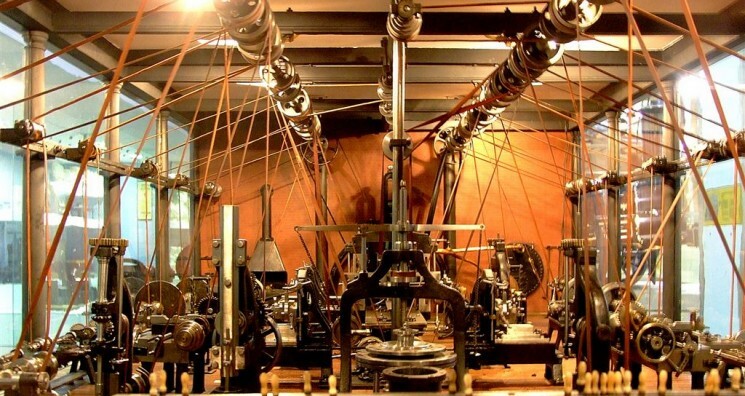 Machine, or Engine, in Mechanicks, is whatsoever hath Force sufficient either to raise or stop the Motion of a Body… Simple Machines are commonly reckoned to be Six in Number, viz. the Ballance, Leaver, Pulley, Wheel, Wedge, and Screw… Compound Machines, or Engines, are innumerable. The word engine used as a (near-)synonym both by Harris and in later language derives ultimately (via Old French) from Latin ingenium “ingenuity, an invention”. CAMPAIGN SIMULATION : Just have a look on how you can design your own campaign.